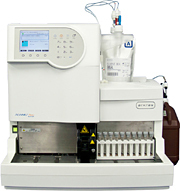 The ADAMS A1c, HA-8180 is a fully automated Glycohemoglobin (HbA1c) analyzer based on HPLC (High Performance Liquid Chromatography). HbA1c is a good parameter for long-term blood glucose monitoring in patients suffering from diabetes mellitus. There are two types of HA-8180. For the measurement of variant Hb, HA-8180V is suitable. HA-8180T is highly effective for ß-thalassemia testing. Measurement items are as follows. HbS and HbC can be detected. HbS, HbC, HbE and HbD can be detected.